Today I have another indie brand, Black Sheep Lacquer (formerly know as Funk Blend). Erin’s hand blended polishes are cruelty free! She generously sent me three of her creations for review. Thanks Erin! Let’s jump right into the swatches! “I was inspired by the colours in a wasp. Screw the sweetness of the bumble bee, I wanted to create something with bite! Its a yellow and black glitter polish in a yellow jelly base. There’s small bits of red and brown hex glitter to give it more depth. 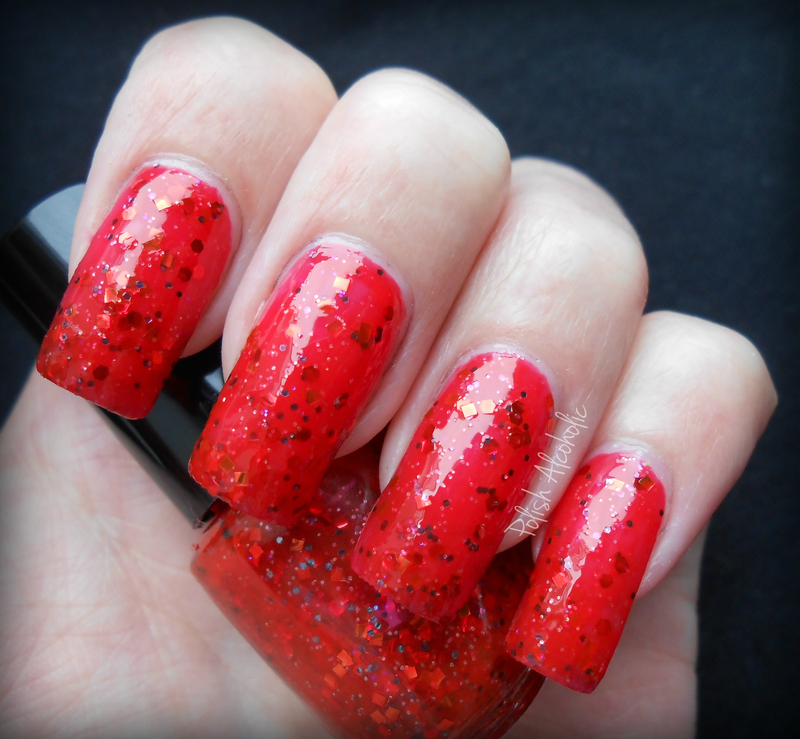 The polish in the bottle appears completely different than on the nail, when worn its bright and vibrant”. (source). This polish surprised me because of the major color difference in the bottle and on the nail. When worn on its own it’s very bright yellow jelly while in the bottle its more greenish. I layered one coat of Stinger over a yellow base to make it even brighter 🙂 Formula is fine and the application went easy. I needed to replace just a few glitter pieces. Pretty cool ha?! Grab yours at Erin’s Etsy shop for CAD 9.00/€ 6,07 (full size) or CAD 4.00/€ 3,03 (mini). And since you’re there you might want to purchase at least two of her creations because then you will get a free hand made cuticle balm stick! Sounds great ha! You can find Black Sheep Lacquer on Facebook and Twitter too! Support her works of art and leave her some love girls! This entry was posted in Indie and tagged black sheep lacquer, black sheep lacquer funkblend, black sheep lacquer red letter day, black sheep lacquer stinger, black sheep lacquer swatches, funkblend nail polish, indie nail polish, indie polish by Polish Alcoholic. Bookmark the permalink. They are really pretty! Especcially Blend and Red letter day. I love your swatches. Are your nails 100% natural or have you some acrylic on them? Got I can’t imagine my nails to grow so long and pretty. Red Letter Day looks lovely. Great swatches! I am starting to settle down about all the indie polishes – some that came and went – some far too hard to get in the first place – most over priced – most lines far too many glitter bombs … I mean I have glitter in every color, size and shape now…plus we are starting to see some of the main lines catch up to the trend (a bit). I am looking for the next big indie thing to hit like great colors that no one else has done for a time and load them with glass fleck in the way that ChG can do but does not do often enough (for me). I think it’s good the indies hit – they pushed aside the main lines with a BIG force that I am sure the main lines never thought could happen. AH! They look so pretty! I mean, i knew they were pretty previously, but you really did a nice job with them. thanks so much for the review, i’m so glad you did the yellow one. The colour in the bottle is awful compared to how it looks on, it’s not even a tinge of green like the bottle reflects.